Physical Limits II by Ray Barrie, Mon Amour by David Lamelas, and Bearings by Patrick Killoran. Physical Limits refers to a group of experimental sculptures that Ray Barrie produced between 1967-69, and more recently, presented as “three-dimensional documentations” at Las Cienegas Projects. Using the evidence of drawings, photographs, models and commentary from his archive, Barrie’s aim has been to re-enact a process, rather than reproduce the “original.” In this sense, physical limits pertain not only to the object, but also to the way memory elaborates and limits the interrogation. Barrie’s approach to medium has been consistently direct and unequivocal. In this respect, he has been associated with sculptors at St. Martin’s School of Art, who were influenced by the New Generation movement. At the same time, Barrie has been concerned with procedures of dynamic interaction, experiment and impermanence, which he took to their logical extreme in Unsculpt, the systematic destruction and disposal of his wood and blue rope sculpture at the Institute of Contemporary Art, London in 1969. In the same year, he built the first model for Physical Limits II, initially conceived as a large-scale interactive structure for an outdoor public space. For Barrie, the inclusion of the body is not an anthropomorphic metaphor, but once again, a material with physical limits, experienced in the act of stepping up or down, moving forward or backward, rotating and negotiating the phenomenological effect of the mirror’s doubling. In the 1960s, the convergence of objects, actions and performance was prompted by social activism, most notably, the anti-war movement. Although this marks the historical limit of Barrie’s “document,” his reinvention of the armature as a participatory, non-hierarchical, time-based event still resonates. David Lamelas is among the most important voices in the conceptual approach to art, with a particular focus in the field of film and cinema. 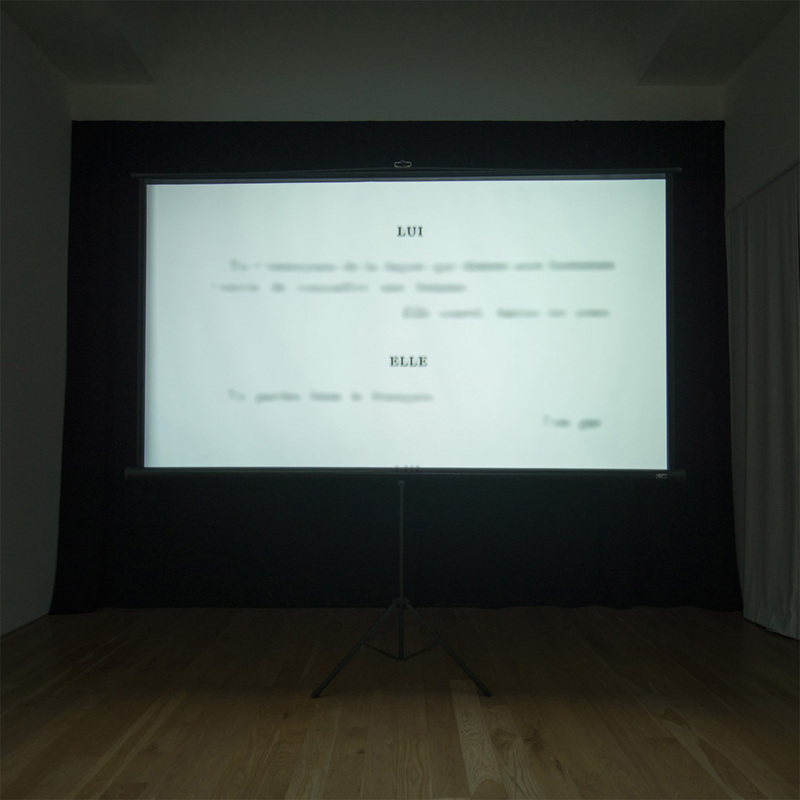 In his projects, Lamelas addresses the limits of art’s temporality, and its potential for creating alternative processes of communication and cognition. With Mon Amour, David Lamelas is reconsidering his “Reading Films” of the 1960’s: Reading Film from “Knots” by R.D. Laing, and Reading film from “Labyrinth” by J.L. Borges. Lamelas explores the phenomena of film reading as opposed to that of film viewing. Toying with the implicit contradiction, Lamelas’ films are to be visually read, not just watched. The artist draws from a historical interest in films from literature, as narrative cinema most typically progresses from literature, to screenplay, to the image of film. In Mon Amour we do not see images; we see only the screenplay, but it is blurred. As the camera pans through the blurred text, we understand that we cannot read what is presented before us. The only thing Lamelas allows to be legible is “Elle” (She), but we miss her lines, and “Lui” (He) but we also miss his lines, drawing us to the essential abstraction of the film. In the same way that we do not understand the shapes in an abstract painting, the meaning here is created by a mixture of essential shapes and forms. As the film rolls, we are coaxed by the “mood” of the passage of time into a meditative state. Patrick Killoran’s project Bearings is an exterior installation that advances the artist’s ongoing exploration of American consumerism. Killoran has placed a lemon tree in the courtyard and surrounded it with what might be considered its fruit. In place of lemons he has provided us with an array of yellow consumer products. The lemon tree sits in its original crate; the “fruit” sit below the tree on the ground in an arrangement that mimics the disarray of fallen lemons. This contrast between the manufactured and the natural is an apparent tension in the work. Neither the manufactured goods nor the lemon tree completely explain this opposition. The viewer must consider the necessary preconditions outside the piece and address that which is not, and cannot be, included. The actual “tree” that produces these commodities is the astonishing manufacturing base that defines consumer capitalism. A system that does not just produce manufactured goods but also a wide array of services, plants and animals, and that somehow remains mysterious and arrives to us in media res, as a story that always began elsewhere. 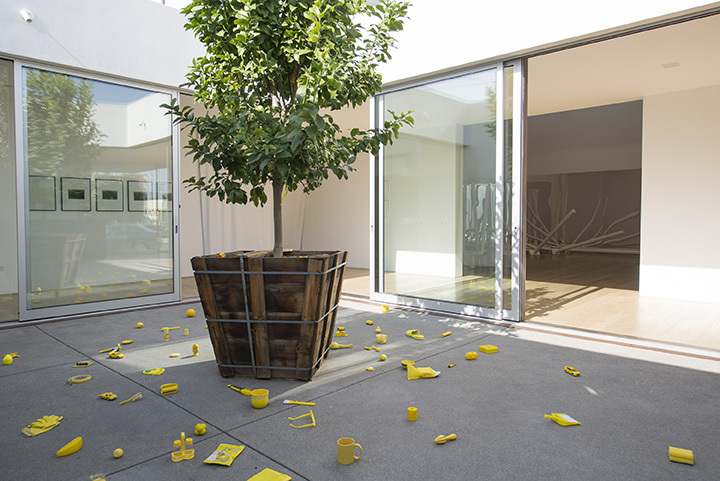 Indeed, this includes the standard eureka lemon tree placed in the courtyard. The scale and complexity of this system is difficult to fathom and Killoran’s work suggests that some monstrous contortion of nature is always at stake.